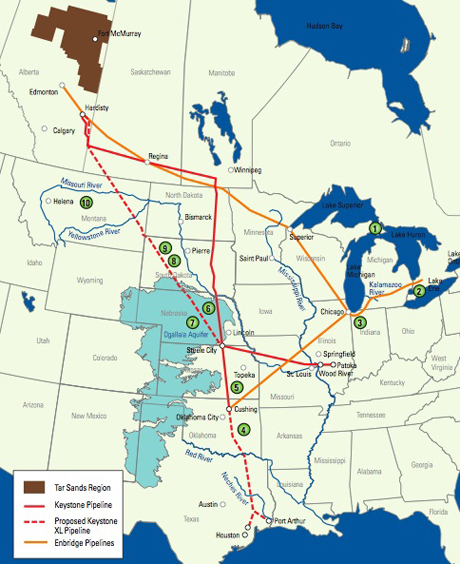 The proposed Keystone XL Pipeline extension would transport crude oil from the Athabasca Oil Sands in Alberta, Canada to refineries in Illinois and Oklahoma, and then to the U.S. Gulf Coast for transport. The Keystone extension has faced criticism from environmentalists and some members of Congress. In 2010, the U.S. Department of State extended the deadline for federal agencies to decide if the pipeline is in the national interest. In the end, it will be President Obama’s who makes that decision. It is August 25, the sixth day of demonstrations against the Keystone XL taking place in front of the White House. Before the demonstrations are over, organizers estimate at least 1000 will be arrested in one of the biggest environmental actions its kind in decades. The stakes are high for those who live along the pipeline’s proposed route, as well as for the entire planet. According to environment activist Bill McKibben, the proposed pipeline, could be game over for climate change. The pipeline extension would insure an expansion of the extraction and processing of the thick oil, thus increasing greenhouse gas emissions. In addition, the pipeline would raise the risk of spills and damage to aquifers and waterways along its path. The Koch brothers. who have bankrolled the Tea Party movement, climate change skepticism and right-wing think tanks, such as the Cato Institute, are involved in the Alberta Tar Sands oil industry, and stand to gain financially if the pipeline is approved. Eminent research scientists oppose the Keystone Extension. The following is a letter from twenty climate change scientists urging President Obama to stop the Keystone extension. They work at top institutions such as Harvard, Princeton, Stanford, Cornell, University of Chicago, the Woods Hole Research Center, Scripps Institution of Oceanography, and others. We are researchers at work on the science of climate change and allied fields. We are writing to add our voices to the indigenous leaders, religious leaders, and environmentalists calling on you to block the proposed Keystone XL Pipeline from Canada’s tar sands. When other huge oil fields or coal mines were opened in the past, we knew much less about the damage that the carbon they contained would do to the Earth’s climate system and to its oceans. Now that we do know, it’s imperative that we move quickly to alternate forms of energy—and that we leave the tar sands in the ground. We hope those so inclined will join protests scheduled for August and described at tarsandsaction.org. (To see the names of the scientists who signed this letter, click here).